It is one of the crazy things happening sometimes that the poor reconstruction raised a great idea in the mind of the German paleobotanist Zimmernann . The result was his Telome Theory of plant evolution, which became, and still is, widely accepted but also much disputed. His construct of an archetypal plant was meant to represent the simplest early land plants. So it is surprising to see that the real plant is even simpler than the model plant derived from it. According to D.S. Edwards it grows in only one direction, which is upward, until it falls over, grows rhizoids where it touches the ground, and turns upwards again . Falling over is not quite a bad idea as the plant would finally do so if it had not invented a more clever option which consists in turning downwards intentionally. The latter is obvious from the observation that the radius of curvature of the downward bend is as small as about 1.5cm or even smaller. As indicated in the drawing on the right, the overall shape may simply be dominated by repeated forking*, with one or two prongs of the lower forks growing downwards on purpose, touching the ground, etc. This reminds one strongly of the habit of roots. Hence, what we see here might be a glimpse at roots in the making. 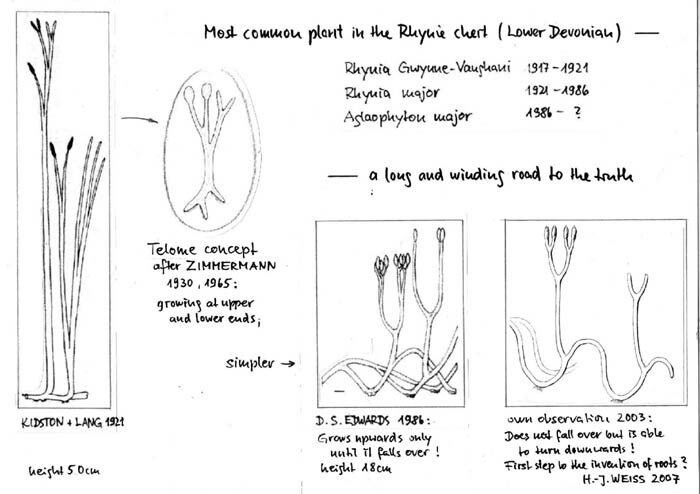 As pointed out by Dianne Edwards , the change of name into Aglaophyton by David S. Edwards  was not well justified and the placement outside the tracheophytes by others is questionable. The reason why it took a long time to find out the overall shape of the most abundant Rhynie plant is the preservation in chert, which provides tiny detail even inside cells but does not easily reveal the large-scale structure. The chert is essentially isotropic and hence does not show cleavage planes with compressions of whole plants. Reconstruction by cutting thin slabs or by successive removal of chert is laborious since fresh and more or less decayed specimens are usually silicified in a confusing tangle. In view of this, it would not be surprising if the reconstruction of Aglaophyton had to be further modified. *According to other and own observations, this plant is able to branch not only by forking but in the lower parts also by lateral buds growing into shoots with rhizoids. (See Rhynie Chert News 52). Hence, this plant may be more tangled near the ground than suggested by the drawing on the right which is to visualize the principle of downward growth. As another observation, the upward bend is usually not nicely U-shaped, as already indicated in the 1986 drawing. Trans. Roy. Soc. Edinburgh 51(1917), 761-84. W. Zimmermann : Die Phylogenie der Pflanzen, 1930, 2. Aufl. 1959.